I’m 5 years old. I live in Broken Arrow, Oklahoma and I have two siblings – Eleanor (age 3) and Hadley (age 3 months). I love to learn and I enjoy putting on shows that include dancing, singing and acting! When I grow up, I want to be a doctor to help kids in the hospital feel better. 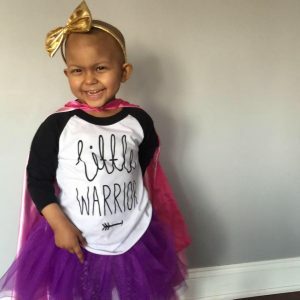 At age 3, I was diagnosed with stage 4 high risk neuroblastoma. Through everything, my parents say I always go to the hospital with a smile because I know the doctors and nurses are trying to help me. They say I do this without prompting or explaining – seems like I just know they are here to help. My favorite Candlelighters NYC experience? I like the FDNY boat ride with Marine 1 and I like the princess showroom! My parents like Candlelighters NYC because they know there is someone there for us when we are far from home. …And my family uses these words to describe Candlelighters NYC: A blessing! Click here to donate to Candlelighters NYC in honor of Charlotte.